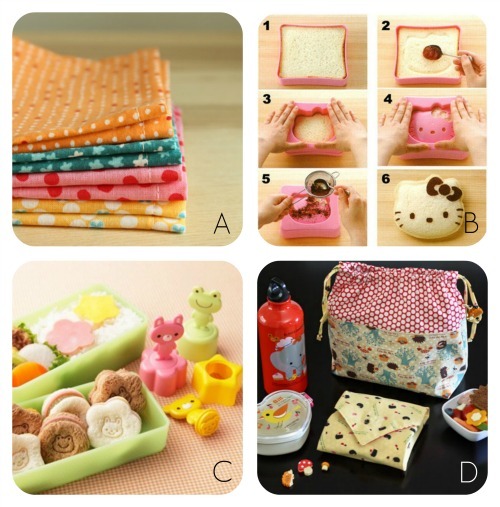 I love the idea of using cloth napkins in a lunch box. And this set of fabric is so cute! It would be fun to put together a set that matches each child's personality. for a Hello Kitty sandwich. And the cocoa powder added in the last step... LOVE! stamped on your little sandwich. I really want a set of these. that folds out into a place mat. This is a perfect little set for school. Adorable! Did you have a lunch box? Do you remember who/what was on it? Those napkins are such a sweet idea. Love that Hello Kitty sandwich maker, off to investigate further. I had a Holly Hobbie lunch box and later had a Charlies Angels lunch box. My daughter would love that hello kitty sandwich- I used to love strawberry shortcake. Did you have the dolls too? I had a Holly Hobby lunchbox. Don't you know I wish I could put my hands on that now! I had a blue plastic Smurfs lunchbox. I recently saw some at Old Navy. I almost bought one for nostalgia's sake, even though they did not have the same picture. 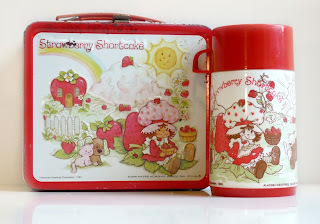 I had the Strawberry Shortcake lunch box you have pictured! I love those lunch ideas. Better than the brown paper bag I usually carried. I did have lunchboxes for awhile, one had Roy Rogers on it. But I got so good at breaking thermoses (they had glass inside) that I was left holding the bag. Oh, what a terrible pun! Forgive me. Love the idea of the sandwich wrap/placemat and the bag is so cute! I had an metal Annie lunch box (which I of course lost) but found the thermos in my mom's basement. I then bought a similar lunchbox on ebay and have them displayed in my sewing room! Totally had the exact lunch box as a kid!! Those were the days!! Love all these ideas, thanks for sharing! Such cute pins- love them. 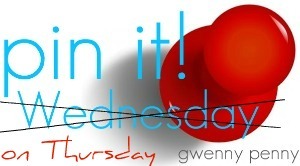 Aah, these are great idea, Gwen! I had a teddy bear lunchbox but it would never stay shut properly and would repeatedly drop my lunch on the playground. The trauma of schooldays!! I had that Strawberry Shortcake lunchbox, too. I always thought a matching Thermos was awesome. I had that exact lunch box! My lunchbox was a metal one with small pictures of different types of trains on it. I don't think I ever used it for school though since I was only in kindergarten...I used paper bags in Jr. & Sr. High School.